Nightclub managers are responsible for managing the day to day tasks of the nightclub such as bookkeeping, marketing, customer service etc. A nightclub manager is a skilled person who plays a vital role in promoting the business of the nightclub and ensuring that it is working efficiently. The resignation letter is the best document for those people who want to communicate with their employer to let him know about leaving the job. The employee should show the feeling of gratitude in the resignation letter. It should also be told in the resignation letter that you are ready to offer every type of help in order to make the process of transition smoother. Being a professional person, your tone should be positive throughout the letter. It should be kept in mind that being an employee, you have a right to leave the job and you are not obliged to tell the employer what is the reason of making the decision to leave the job. However, if the employer is taking a keen interest in knowing the reason for this decision, you can tell him by meeting him in person instead of writing the reason in a resignation letter. 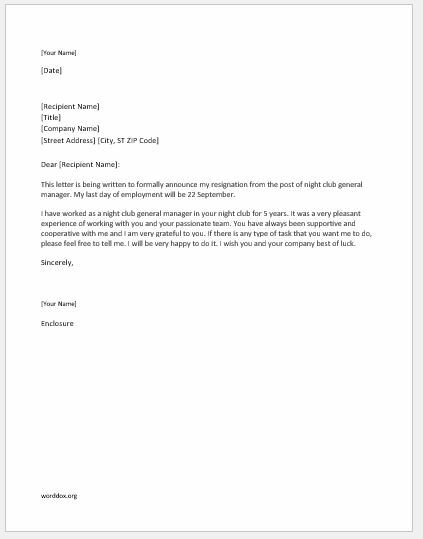 Here is a sample resignation letter of the night club general manager post. This letter is being written to formally announce my resignation from the post of night club general manager. My last day of employment will be 22 September. I have worked as a night club general manager in your night club for 5 years. It was a very pleasant experience of working with you and your passionate team. You have always been supportive and cooperative with me and I am very grateful to you. If there is any type of task that you want me to do, please feel free to tell me. I will be very happy to do it. I wish you and your company best of luck.